The 2014 winter intensive was a fantastic experience! Thank you to all of the master teachers and participants who made the journey to Eureka. 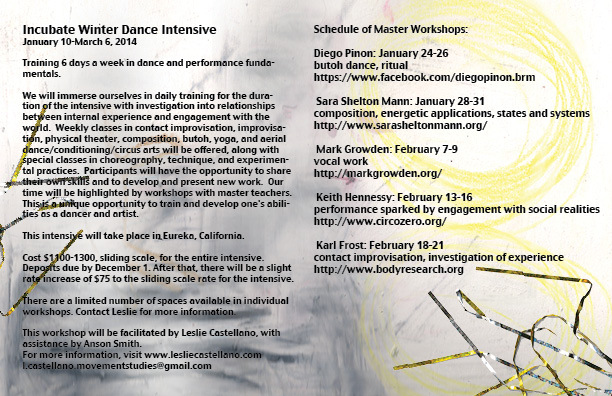 Please keep in touch about upcoming intensives. Training 6 days a week in dance and performance fundamentals. We will immerse ourselves in regular practice and daily training for the duration of the intensive with special focus on contact improvisation, improvisation, and the relationships between internal experience and engagement with the world. 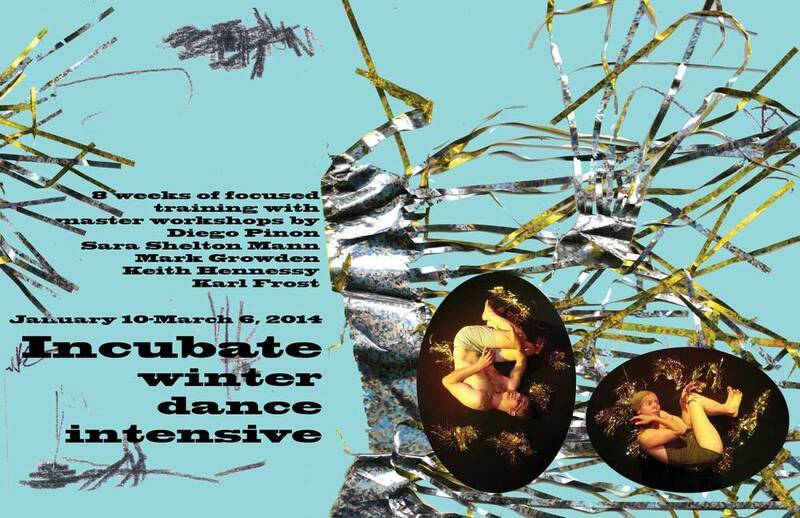 Weekly classes in contact improvisation, improvisation, physical theater, composition, butoh, yoga, and aerial dance/conditioning/circus arts will be offered, along with special classes in choreography, technique, and experimental practices. Participants will have the opportunity to share their own skills and to develop and present new work. Our time will be highlighted by intensive workshops with master teachers. This is a unique opportunity to train and develop one's abilities as a dancer and artist. This intensive will take place in Eureka, California. Facilitated by Leslie Castellano, with assistance by Anson Smith. Cost $1100-1300, sliding scale, for the entire intensive. There are a limited number of spaces available in individual workshops. (Cost is $200-240, sliding scale, for individual workshops, except for Mark’s, which is $150-190). Deposits due by December 7 (extended!!!). After that there will be a slight rate increase of $75 to the sliding scale rate for the intensive. *Fees do not include food or lodging but we will help find friendly, cheap sublets (approx $350 or less/month). *We will take turns cooking for one another on an approximately 3 week rotation.